The pollsters have wrapped things up for the year, meaning we’re in for a couple of weeks free from the temptation to number-crunch minute changes in percentages and extrapolate results from what are only ever snapshots, not predictions. 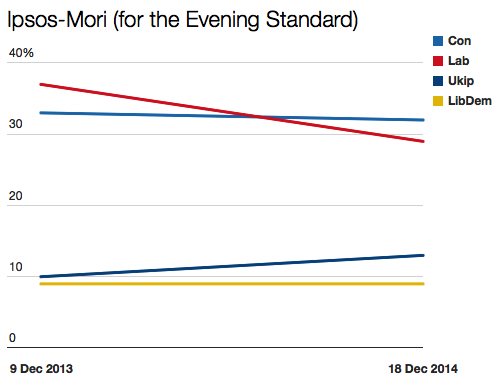 I’ve had a look to see how the final polls of 2014 compare with those from 12 months ago. There are some clear and common trends, but also a few inconsistencies. 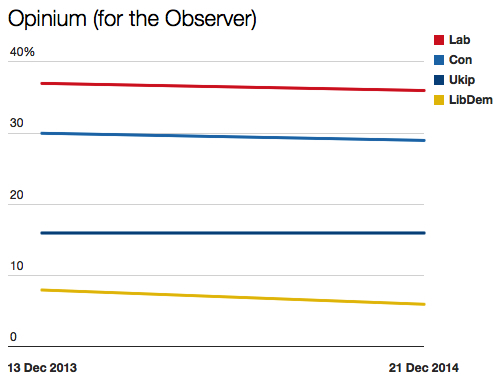 Opinium’s figures show a tiny decline for Labour (-1) and the Tories (-1) while the Lib Dems have fallen a little more (-2), and Ukip has stayed exactly the same. 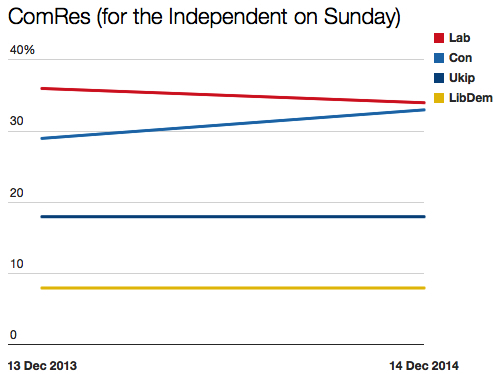 The Tories have stayed put on 35% while Labour and Ukip have fallen two points and the Lib Dems have dropped one. 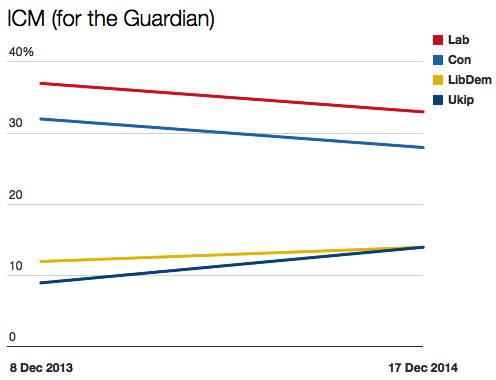 Here, Labour and the Tories are both down four, but the Lib Dems are up two and Ukip is up five. 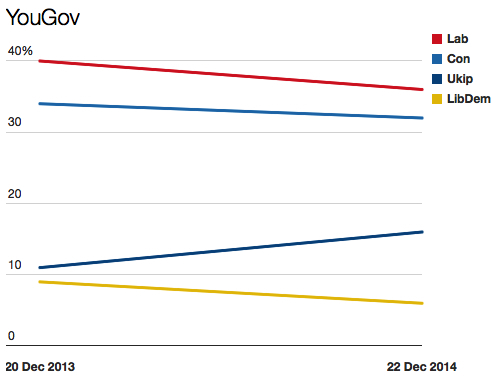 While the Tories are down one point, Labour is down eight: enough to leave the party three points below their rivals. 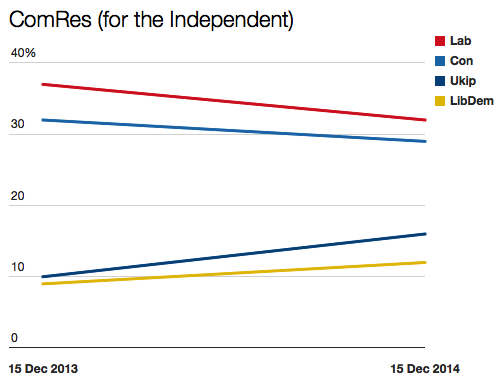 The Lib Dems are exactly where they were 12 months ago (on 9%) while Ukip is up three. ComRes is the only pollster to show a rise for the Conservatives, putting them up four points compared with this time last year, while Labour is down two. Labour is down five, the Lib Dems are up three and Ukip is up six. Labour has dropped four points, the Lib Dems are down three and the Tories have fallen two. 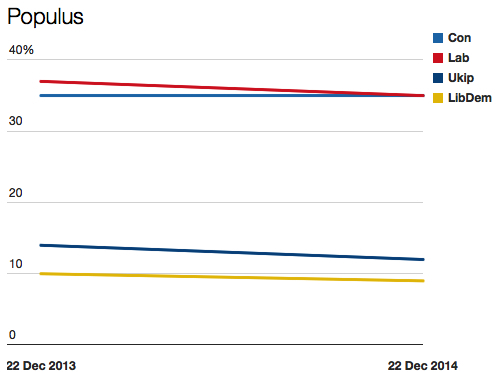 Only Ukip has risen, up five points. Labour is down from 37.3% to 33.6% and the Tories have fallen from 32.1% to 31.1%. The Lib Dems have slipped a fraction, from 9.3% to 9.1%. Ukip is up from 12.6% to 15%. Labour’s lead of 2.5 percentage points over the Tories could be enough to see it become the largest party in the next parliament, though I suspect regional variations, particularly in Scotland, would see the party denied a majority. 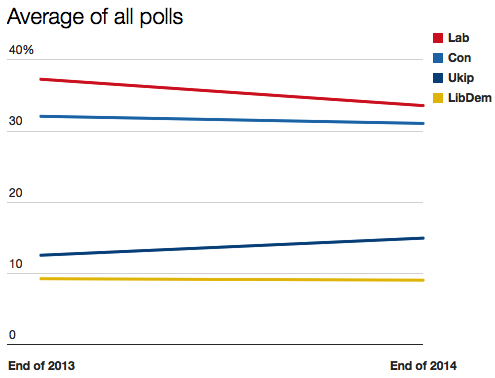 But that’s speculation based on polls that belong to 2014. For more data, we must now wait until next year: election year.